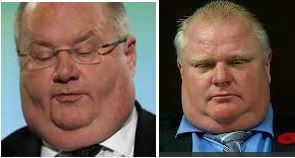 Has anyone else noted how Eric Pickles bears a striking resemblance to Rob Ford, the (multiple) substance-abusing Mayor of Toronto? Ford has probably done more than anyone else globally to bring the directly-elected mayor model of city governance into disrepute? Talking of ‘disrepute’ , it is a while since I blogged on Eric. But recent actions illustrate the ‘abuse’ with which he discharges his role in government, and provide an indicator of what may be an increasing trend of government behaviour in the run up to 2015 elections. Let me give two distinctive but disturbing examples, starting with the ‘Law and Order’ critique of the Right Honourable Member for Brentwood. Those of you who follow my writing will be aware of my admiration for this US drama, and for the interesting, challenging, and sometimes progressive, policy positions taken by the Assistant District Attorney (ADA), Jack McCoy. One of the most moving examples of this is ‘Hate’, Season Nine, Episode Ten. In this, McCoy prosecutes a neo-Nazi leader for complicity in the murder of a school girl by three of his followers who were ‘minors’ of limited intelligence from the New York white ‘underclass’. Although the fascist has no direct involvement in the planning and execution of the crime, McCoy argues (successfully against US first amendment rights of free speech) that his incessant whipping up of hatred in advocating aryan extremism to the perpetrators made the crime entirely predictable. Therefore, the fascist is deliberately reckless and culpable. Wouldn’t it be wonderful if our government represented the values and convictions of Schiff and McCoy in my metaphorical use of this episode? But – no! I am afraid. in my read-across, Pickles plays the part of the neo-Nazi ‘populist’, rabble rousing, criminal. In a House of Commons debate on 8 January 2014, Eric Pickles was commenting on Luton’s need for 30,000 new homes, only 6000 of which can be provided within Luton Borough Council’s (LBC) boundary. Given Labour’s emerging ‘right to grow’ policy for tightly-bounded urban councils, Pickles chose to attack Labour LBC’s approach. He accused them (and I quote) of “trying to bully North Hertfordshire Council…using terror tactics and being extremely unpleasant“. I have no particular insight into whether LBC has tried to ‘bully’ or be ‘extremely unpleasant’ – but ‘terror tactics’? Mr. Pickles is well aware of the huge threats to Luton’s peace and prosperity caused by the attention given to the town by both religious and right wing extremists. Indeed, his own department explicitly praised LBC’s efforts to counter ‘extremist narratives’, and explored LBC and Blackburn leading a national special interest group for this effort in their 2012 ‘Creating the Conditions for Integration‘ publication. So to now accuse LBC with an ‘extremist narrative’ of his own is, AT BEST, grossly irresponsible. I sincerely hope this doesn’t happen. But the next time the English Defence League (EDL) and religious extremists vent their own brand of violent ‘hate’ on the streets of Luton, I hope Mr Pickles is held to bear some responsibility. As a member of a government committed to a continuing ‘war on terror’, if LBC is named by a government minister as a user of ‘terror tactics’, how do we expect extremist activists to respond? To use the McCoy analogy, Pickles will absolutely have known how his comments could be interpreted by extremist sections of the community, and is therefore recklessly culpable. I am interested in readers’ views on this, but for me, compared to, say, ‘plebgate’ I would have thought that a prima facie case could be made that this should be a ‘resignation’ matter. Of course, if Mr Pickles doesn’t feel reckless incitement to hatred is grounds for resignation, he could consider his position in terms of competence and capability. Take the recent decision dismissing the judicial review challenge of six London boroughs against Pickles’ planning reforms allowing offices to be converted to homes without planning consent. Mr Justice Collins ruled that Pickles’ decision was ‘lawful’, but that it had been taken without working out in advance how local authority (LA) applications (for exemption from the reform) were to be assessed; and, therefore, without giving the assessment criteria to LAs wishing to prepare an exemption proposal. In other words, government made up the policy as it went along. And like New Homes Bonus, abolition of regional spatial strategies, and numerous other decisions before it, the Secretary of State has no informed idea of what the consequences and impact of the policy will be. This type of approach to policy development has resonance with the recent Mark Duggan inquest verdict. There, the Jury ultimately determined (by an 8-2 majority) that the killing was lawful. However, the inquest confirmed that it was full of operational, tactical and strategic errors of fact and judgement by the Police, and the Police accepted it had seriously undermined police-community relations. Similarly, Pickles stewardship of DCLG is (normally) technically ‘lawful’, but full of multi-layered errors of fact and judgement, such that, for instance, in the latest analysis of local government’s confidence in the Secretary of State and his department, he scored an unprecedented -90% (i.e. 5% of local government have confidence in him and 95% don’t!). These two cases epitomise so much of the character of this government, and particularly the Tory part of it. Their use of populist, rabble-rousing language (from labour council ‘terror tactics’, to welfare ‘scroungers’, immigrant benefit and health ‘tourists’, to bogus claims of flag flying ‘victory’ over ‘petty Brussels bureaucrats’) is a key part of the Tory’s ‘little Englander’ narrative and UKIP-voter appeasement in advance of 2014 local and 2015 national elections (featured in my November blog). Pickles’ policy-making is an exemplar of the back of an envelope, making it up as we go along, political machinations of the administration. We can expect these to increase as we approach the 2015 election. « Has Borgen lost the X factor? GE2017 – Democratic renewal or a further indicator of the UK failing state?